Running in a 5K is an awesome experience! It’s really difficult to maintain healthy habits and an exercise program when there’s so much else to get done. Why is it that the first things we take out of our daily routine are the very things that keep us going? I’m guilty as charged. I know I should get more exercise, but I don’t. I know I should drink more water, but I don’t. Carbs are bad, but just try to take away my bagel. I watch Biggest Loser. I see the Facebook posts and pictures from friends who are logging miles with Nike, checking in at the gym, eating vegan meals, participating in Tough Mudder events or biking a distance I wouldn’t dream of going without a car and scheduled rest stops, but I do nothing. After a hectic week at work or a never-ending string of school events and evening activities for the boys, before you know it, I started substituting Coke Zero for my water and instead of taking 20-minute walks or jogs I began punching the snooze button for the same amount of time on my alarm. The lesson I learned? You don’t have to be a perfect runner. You don’t have to give up eating carbs. And you don’t necessarily have to go jogging at 4:30am—there’s something to be said for getting enough sleep—unless you want to do all those things. All you really need is motivation, the ability to start in small increments and build momentum, and the willingness to forgive yourself when the going gets rough so you can start again. With all that said, my husband and I started walking early in the morning late in the summer. When cooler mornings moved in, we added jogging to our routine. So we set our sights on running a 5K together in late September. Setting a goal with a deadline is good motivation, but there’s a better chance of success with a solid plan. 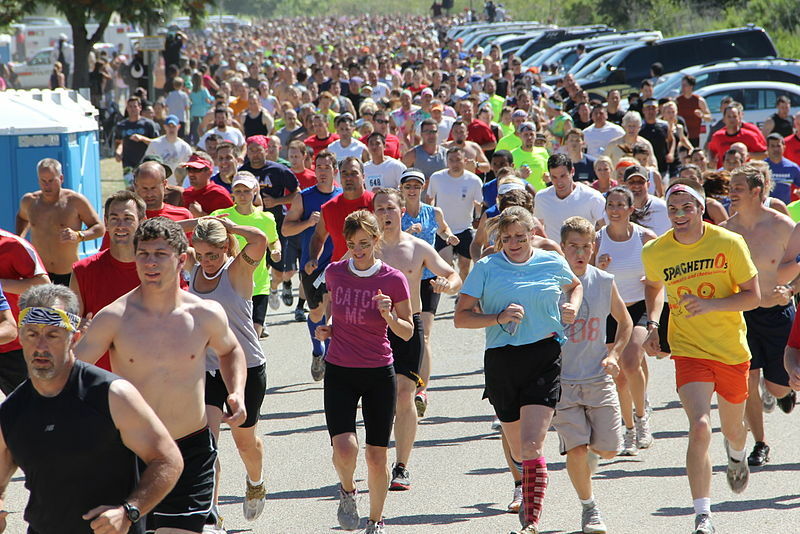 If you’re not a runner or have never participated in a 5K (3.1 miles), then you really should choose a Couch to 5K plan—there are a plethora of apps and you can usually find a class at the local Y or health club—which breaks training into a manageable daily schedule of walking, jogging, and cross-training options over four to eight weeks. I have trained twice before as part of a program—the last one being with the Y running outside during February. (Nothing improves your run time at the end of eight weeks like shedding 20lbs of winter clothing!) In 20 – 60 minutes a day, you’ll be ready for the race. It wasn’t easy training for the September race. Life got in the way, again, and our training was rather inconsistent…okay it was basically nonexistent, but that didn’t stop us. 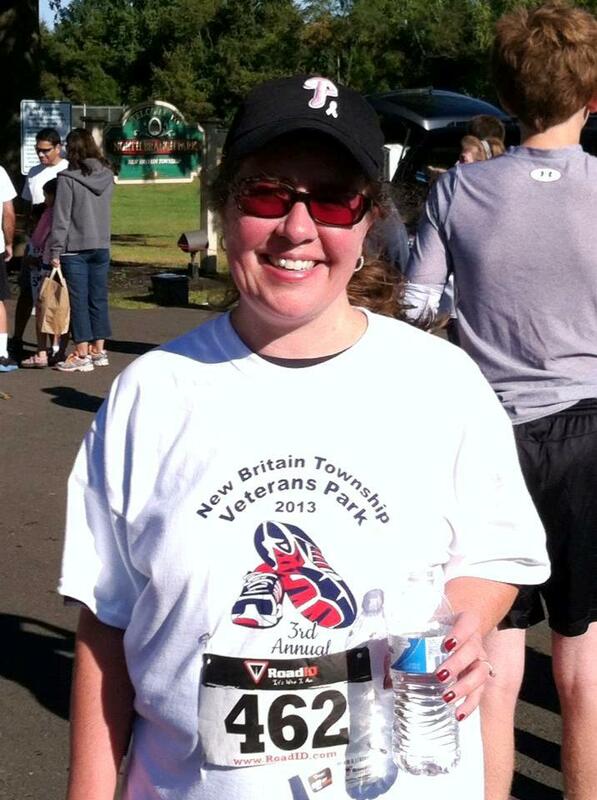 Knowing the race course was flat and being motivated to raise money for a planned veteran’s park, we showed up. Three days before the race I jogged a hilly 1.7 miles in roughly 20 minutes. I’m not great at math, but to me, that calculated into a respectable finish time of less than 45 minutes. I was thinking about the picture I would post on Facebook! On a runner’s high at the finish of my fall race! And yes, I posted this on Facebook too! With my goal of running a 5K for the first time in years accomplished, sadly, the high didn’t last long. This fall, exercise and “me time” were replaced with more hours at work and a busy family schedule. In a recent moment of mental disarray—okay, probably more like a hormonal imbalance with a lack of Starbucks and absence of downtime—I realized it was time to take a step back and breathe deeply to regain some perspective and natural energy to keep moving forward. A power walk or leisurely jog around the neighborhood and eating healthy really do make a difference! Since taking that step back and returning to a few minutes of fresh air and shocking the cardio system back to life, I feel more energized to tackle each day with less stress and a more positive outlook. I’m motivated to keep exercising because it feels really good, the holiday party season is fast approaching, and I’m going to a family wedding in January where probably 99.9% of those under 30 are Cross Fit fabulous. Yeah, I’m really motivated to keep moving. But I’m not kidding myself. The first thing to go when the going gets tough will be exercising and eating well. No worries though, I’ll dust off my weights and running shoes to begin—again. Hey, the 5K season ramps up in March. Do you exercise regularly or set aside time in your busy schedule just for yourself? What motivates you? Finish a race or reach a personal goal? Friend us on Facebook and share a photo of you doing something you enjoy just for yourself! Congratulations on your 5K — and your commitment to keep working exercise into your schedule! I’m a regular exerciser and I appreciate how difficult it can be to stay committed. What makes a difference for me: remembering that I truly feel better when I exercise — that helps me to make it a priority. And believe it or not, putting a little checkmark on my calendar every day after I’ve worked out helps me keep up the commitment on a daily basis — silly but true. When the kids were little I’d work out during naptime, or strap them in a stroller or backpack and take them on a walk with me. It doesn’t have to be a big workout — an hour’s walk is fine. The same goes for healthy eating — I stopped “treating myself” to junk food when I realized I felt better when I had an apple instead…. Kudos to you for staying on the path of making healthier choices!